Posted by ronannarbor in Broadway Musicals, musical theater, Musicals, Theatre. Musical Theater is in full swing on Broadway this fall, with some new material, and some revivals — and the good news is, whatever you choose, you’ll be in for a treat. Seen the weekend of November 16 – 18, this trip included revivals of Annie and The Mystery of Edwin Drood, and the new musical Chaplin. 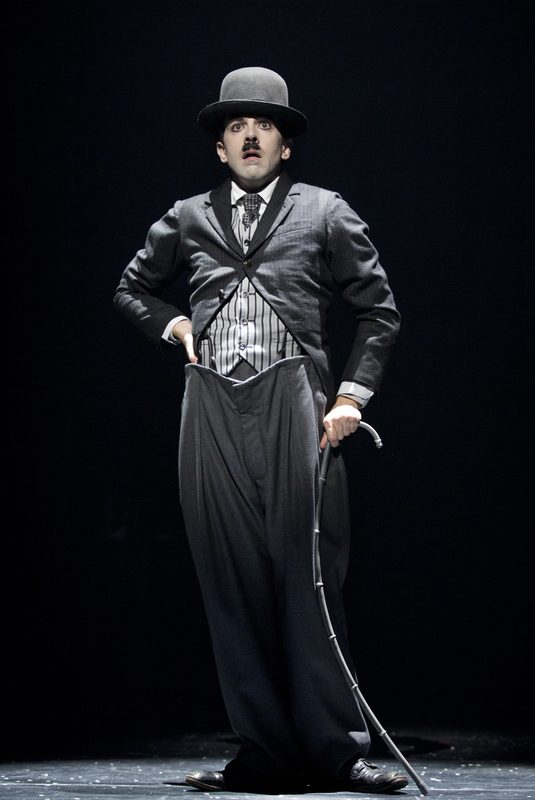 Lets start with the must-see performance of the season: Rob McClure as Charlie Chaplin in CHAPLIN. His physicality is amazing — from balancing on a tightwire, to pratfalls and tap dance, this is a star-making turn for a relatively unknown actor who has been working for years. Not only does his physical performance rate attention, but so does his ability to age from young adulthood to old age over the course of a couple of hours at the Ethel Barrymore Theatre. He commands your attention each moment he is on the stage (which is pretty much the entire 2 hour-15 minutes performance – the show runs 2:30 with intermission). Not surprisingly, the Equity Fights Aids Broadway Cares auction at the end of the show raised 7000.oo for his autographed derby hat. Great performances are also turned in by Wayne Alan Wilcox as his brother Sydney; Jenn Colella as Hedda Hopper, and at my performance Emilee Dupre as Chaplin’s mother, Hannah. Apparently Christiane Noll (the usual Hannah) has a contract which allows her frequent missed performances in order to perform her concerts across the country. Not to worry, Emilee is a terrific understudy. In general, the entire ensemble is solid. The rest of the show doesn’t fare as well — stunning greyscale set design by Beowulf Boritt and costumes by Amy Clark and Martin Pakledinaz lit in shades of white and shadow by Ken Billington can’t hide the horrendous script by Christopher Curtis and Thomas Meehan, and bland music by Mr Curtis. Warren Carlyle’s busy direction and choreography can’t hide the gaping holes in script, and the banality of what is there. Chaplin is a fascinating character to be sure — but there’s little to learn in this musical between good-guy-come-millionaire in Act I, and possible communist spy in Act II. When you start rooting for Hedda Hopper to make it “all fall down” (a lyric repeated ad-nauseum throughout the show) its a sure sign that the audience is looking for someone, anyone, to spark some life into the script. But oh, what a production. There is a reason this almost universally panned-by-critics musical is packing them in from night to night — and that is the cast that is solid from top to bottom, the excellent technical work, and Rob McClure’s simply stunning performance. Its really an evening not to be missed, even though you might leave the theater wondering what this Chaplin guy was all about anyway. Across the street on Broadway, they’re packing them in at the revival of ANNIE at the Palace Theatre, and its a dazzling new production. Directed by James Lapine and choreographed by Andy Blankenbuehler, the show quickly moves from orphanage to mansion and back again with lots of fun along the way. David Lorins forced-perspective sets look wonderful, and some aspects downright magical — take for instance the rooms of the Warbucks mansion, which flip like pages of a storybook as Annie is led from room to room upon her arrival. We are a bit jaded here in the Midwest when it comes to ANNIE — its a show that has been done by every regional, community, high school, and junior high school in America — but its not that true in NYC, where the show made a revival appearance in the late 90’s and now again in this fresh new version. 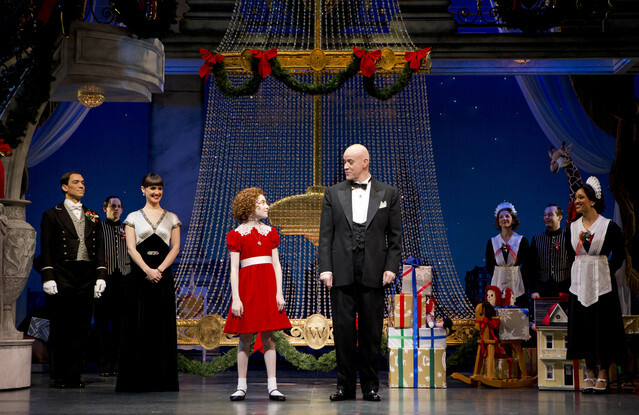 If you’ve seen Annie (and who hasn’t) you deserve to see it done right — with a professional cast and set design. Watching a professional production makes you realize why the show is such a challenge no matter who performs it; not only do you need a strong lead cast, but you also need an excellent across-the-board ensemble to make it all work. While the kids bring in the houses, the show is really about the adults. And what a cast this production sports! Katie Finneran is a dynamo as Miss Hannigan, dripping with little girls (all of them very good). Anthony Warlow makes for a highly likable Warbucks and he is a great actor, singer, and dancer. Brynn O’Malley performs a very strong Grace Farrell and gets to wear Susan Hilferty’s best clothing in the show (Go Blue, Brynn!) but also brings warmth and heart to her role; Clarke Thorell and J. Elaine Marcos (as Rooster and Lili) are hilarious and restrained — Clarke’s Canadian accent in the second act made me laugh out loud. Lilla Crawford, the usual Annie, was out for the evening, and her understudy, Taylor Richardson was superb! You can’t go wrong with any of the kids, and Taylor ranks among the best of the professional Annies (who now number legion). Go see the show — but remember, if your young ones cant sit still for 2 hours 30 minutes, then they do not belong inside the theater. The young ones in the theater come to life when the kids are onstage (which is for about 20 minutes of the entire show) and tune out for the rest. The family sitting next to me in the middle of the orchestra all required straight jackets and muzzles – kids and parents. 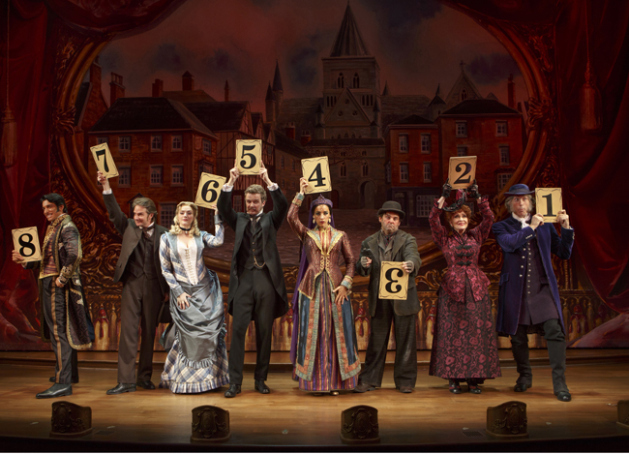 Finally, the revival of Rupert Holmes’s THE MYSTERY OF EDWIN DROOD is getting rave reviews at Studio 54 under the production of Roundabout Theatre Company. This has always been one of my favorite musicals, and your enjoyment will be greatly enhanced if you don’t mind audience participation, clapping and singing along, shouting “Drood” every time the name of the show is announced, and taking great personal responsibility to vote for the detective and the murder in Act II. It looks great at the small Studio 54 theater, and Anna Louizos wraps it all in a Music Hall shell. The split orchestra in the side booths is under the direction of Paul Gemingani and they sound great. William Ivy Long creates the costumes, and they are colorful and delicious. Warren Carlyle choreographs with energy, and Scott Ellis directs with a sure hand and skill at controlling organized chaos on stage. And what a cast! Stephanie J. Block; Will Chase; Gregg Edelman; Chita Rivera; Jim Norton; Andy Karl; Jessie Mueller; Betsy Wolfe; Nicholas Barasch; Peter Benson; Robert Creighton — its a virtual who’s who of current Broadway in multiple generations of performers. Jessie Mueller turns in a particularly wonderful performance as Helena Landless (of the vague and somewhat geographically untraceable accent)…as does Will Chase as John Jasper. But the entire cast shines, and everyone has their featured moment and it all feels just right. While there are alternate endings based on audience vote, you can virtually be assured that everyone sees the same pairings from show to show — comparing who played what with friends who have seen the show over the past week all indicated the exact same actors were voted upon to take up the duties from show to show. Still, it feels fresh and spontaneous, as if the performers really did just learn of their vote. A particularly nice touch is slate-boards that hang over the exit, on which the audience can see that evening’s exact tally of how many votes each suspect got in the audience vote. (by the way, take a close look at those tallies and you will see why the same folks get voted on show after show — the tallies are not even close). You can’t go wrong with any of these current shows. New musicals also running (and previously reviewed in this blog) are A CHRISTMAS STORY and ELF. And the only other new musical entry on Broadway, Kathy Lee Gifford’s SCANDALOUS, has recently opened to horrendous reviews at the Neil Simon Theatre.